US embassy Visa interview appointment confirmation. H1B primary Form i797A or B (H1B approval notice) – Original is best. If not possible, then carry color copy of i797 approval. i797C is not a valid proof of approval. These documents are NOT required to be submitted but recommended to carry in your H4 visa interview. You may be asked by visa officer to show them. Carry all passports including old and expired. Form i797A or B (H1B approval notice) – Original is best. If not possible, then carry color copy of i797 approval. i797C is not a valid proof of approval. Form i129 (H1B application) copy – Carry color or Black and white copy of i-129. H1B LCA copy – Carry color or Black and white copy of LCA posting. Passport copy – Carry color or Black and white copy of first 2 (with photo) and last 5 pages (address details) of passport. Employment verification letter – Original – H1B can get it from employer. Last 3 months Pay stubs/ Salary slips – Color or black and white copy. Last 3 year W2 (if any) – Color or black and white copy. Optional, but recommended. Card from both sides, if available, in original. Optional, but highly recommended to carry to prove that real marriage took place. In Original if H4 applicant is less than 14 years old. There are no issues with H4 visa stamping if your relationship with H1B primary can be proved with above mentioned documents. H1B employer details for verification. City and county where you live. If you are working on H4 or have ever worked. Read whatever you have written in your DS160 form as visa officer can ask questions to verify. Is H1B to H4 stamping eligible for Dropbox? You can check if you are eligible for Dropbox Facility using our app here. We recommend to change your last name in passport too, if you have changed it after marriage. There is no compulsion to change last name though. If you decide to carry on with your maiden name after marriage, your H4 visa will be stamped with your maiden name. This is fine and has no issues. Incomplete Indian Marriage Ceremony Can Result in Permanent ban to Enter U.S. These days, visa officers have started asking if full marriage ceremony happened or not at H4 visa interview time. This is very serious and you should be very careful as U.S. Consulates consider partial marriage ceremony to be Fraud / Misrepresentation or Alien Smuggling. If you just did a small marriage function and will be completing the final marriage according to Hindu marriage act 1955, in India after H4 visa stamping, you could be in trouble. This is true even if you register your marriage under Indian law and procure a legal marriage certificate from the local government authority. Visa office expects you to perform all the rituals as are NORMALLY expected like 7 rounds of sacred fire (7 Phere) etc. to complete the marriage. He may ask you questions to check the validity of the marriage. US Visa officers now understand the Indian culture and can smell fraud with ease. Hi anil, My wife is eligible for H4 dropbox, Does she need to submit Wedding Invitation Card,Wedding Color Photo Album? Its been 6 years as we got married and this is her third visa stamping. Wedding Invitation and color photo album is NOT required for dropbox. My Husband has his H1B valid till January,2020. He came back to India in August,2018 for our marriage and was working in India. Now he has moved back to US on his H1B. He has his 45 days paystubs with him. We are planning to go ahead with my H4 visa appointment with it. What are the chances that it gets delayed? I do not see a reason for H4 visa stamping delay. Do you have anything specific in mind? Nothing specific just that I will be having paystubs of 45 days only instead of 3 months and I have been hearing that very less applications are being entertained related to H1B/H4 these days. 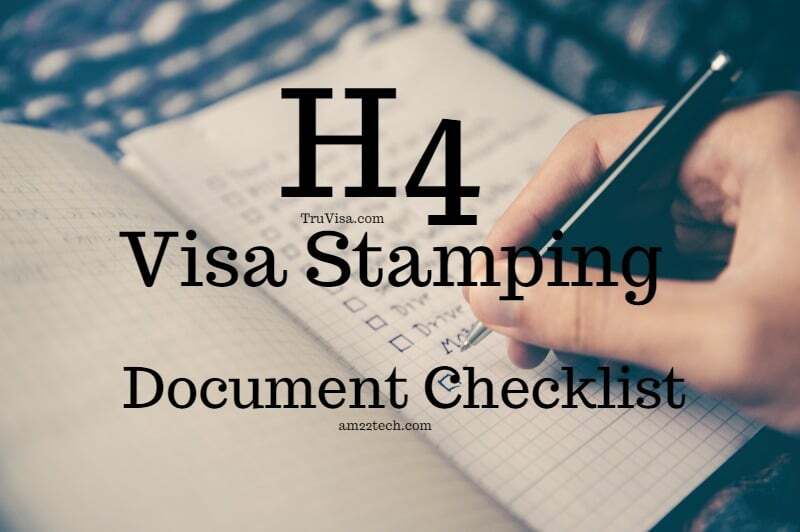 There is no issue with H4 stamping as long as you have H1B approved i797. I have a question on h4 EAD. My husband lives in Canada and is applying for his H4 from there. For applying H4 EAD, would have have to be present in USA? If so, does he have to stay in the country until a decision comes on his H4 EAD? Or can he leave just after applying it? Your husband has to be present in USA to apply for H4 EAD. Once applied, he can travel but he may receive an RFE to prove H4 status which can only be maintained while you stay in USA. So what is the best option in this case if he still wants to maintain his job in Canada and work there while his H4 EAD is being processed here? And only move once he has H4 EAD? Hope that USCIS approves H4 EAD without RFE. Does he have to take biometrics appointment as well in Canada before his H4 Visa interview? I am unable to find anywhere if Canadian PR holders need to give biometrics. I am not sure if Canada PR allows you to have any exception. As per my information everybody has to go through US Biometrics process irrespective of your PR status. My h1 with employer A was expired last Dec, At present I’m in India, transfered my h1 to employer B and got stamped. My wife and kid having employer A h4 which was expired last Dec, they are with me in India. I need to get stamped for them. Do I need to file I539, get h4 approval and then go for stamping? Just do I need to go for stamping with DS160 and necessary docs? You just need to use your new H1B approved i797 to get your dependent’s H4 visa stamp. Fill DS160, take H4 visa interview appointment and you should be good. Anil, Thank you for the quick response. I’ve a baby, need to get a fresh H4 for her. I hope above mentioned also applicable for the baby, please confirm. Was your baby born in US or outside US? Assuming, baby was born outside USA, the process is same. Yes born in India, thank you Anil.. You rocks! !